Conventional single disk confocal scanners rely on pinholes (or slits) to provide optical sectioning and the associated rejection of out-of-focus light. The limitations with this approach are well known and include low throughput, cross-talk between pinholes (where out-of-focus light can leak into adjacent pinholes) and high background resulting from illumination reflection and scattering at the first surface of the disk. Andor’s Revolution DSD, utilizes a unique spinning disk implementation. As we shall see, this approach overcomes the limitations normally associated with single disk scanners. The patented optical design of the DSD has a structured illumination pattern (SIP) built into the spinning disk to modulate the illumination field. In detection, the DSD uses this unique double-sided disk design to exploit both transmitted, T and reflected, R fluorescence emission images to differentiate between in-focus and out-of-focus information. Computer subtraction of these images (T-R) creates a confocal result and provides the name "differential spinning disk". The inventors of the SD-SIM technique referred to the modulation and detection principle as "aperture correlation" 1 . This refers to the fact that the SIP induces a similar structure in the fluorescence emission image and this emission modulation pattern is optically cross-correlated with the SIP at the spinning disk. Figure 1: The disk is made of synthetic quartz supporting a thin layer of aluminium. The aluminium coating is arranged in a pattern of stripes so that light is either reflected from the disk’s surface, or passes through where none exists. There are two patterns in a 1:1 mark-space ratio radially disposed. Our design refers to the inner pattern as “high signal” and the outer as “high sectioning”. You select, through software control, which pattern to use according to your specimen thickness and magnification choice. The SIM approach has been used previously in a number of instruments, but has never been combined with a spinning disk implementation. SD-SIM provides a unique blend of speed and image quality: images can be acquired at up to 100 fps (1 revolution of the disk); and SIP artefacts are removed by rapid variation of the SIP resulting from disk rotation. Note that SIP artefacts are a wellknown problem in SIM2. In a DSD system, the spinning element comprises a single synthetic quartz disk supporting a thin layer of coated aluminium in which the SIP is created by photo-lithography. The aluminium SIP has a 1:1 mark to space ratio (half metal and half space), which means that approximately half of the light falling upon it is reflected (R) and half transmitted (T). This is true for light which is incident from either side of the disk and is a critical feature of the device. 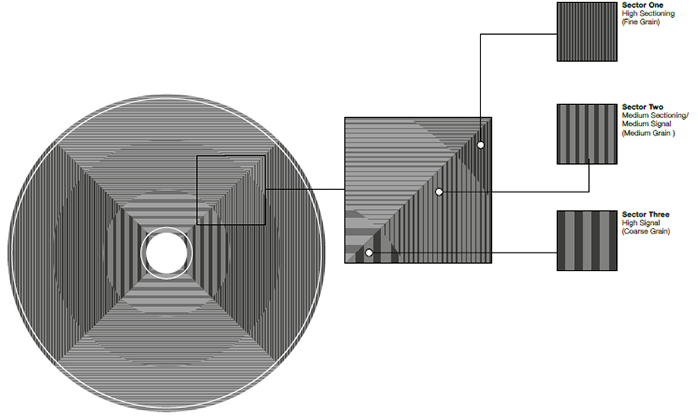 Figure 1 below illustrates the two patterns on the DSD disk: one with a pitch or period of 320 μm on the inner radius; the second with pitch 160 μm on the outer radius. Figure 2: This schematic of the optical path shows the excitation beam in green, while the emission fluorescence beams are shown in orange and yellow to illustrate the different optical paths of the reflected and transmitted signals, respectively. The two signals are combined at the prism and projected onto two halves of the camera. The optical path of the DSD is illustrated in Figure 1. The input illumination from a liquid light guide is collimated, passes through the excitation filter wheel and is reflected from the dichroic mirror. The collimated beam then illuminates the disk which is located at an image plane of the microscope optical system and so an image of the SIP is projected into the specimen. Thus about half of the illumination intensity (green) arrives at the specimen while the remainder is reflected back into the illumination pathway, where it is baffled to minimize background. In the detection pathway, the emission fluorescence signal comprising in-focus (confocal, or C) and out-of-focus (wide field, or WF) light is imaged back onto the disk, where it interacts with the SIP and we make use of the disk’s transmissive and reflective properties. The fluorescent light transmitted by the DSD disk (yellow) comprises the C signal plus about half of the WF signal, while the light reflected (orange) from the disk comprises about half of the WF minus the C signal. In confocal terminology, the SIP is located in a conjugate image plane and hence acts as both the confocal source and detection apertures. Referring again to Figure 1, the transmitted (yellow) and reflected (orange) signals are imaged via symmetrical optical trains which include two identical dichroic mirrors, to a combining prism. This prism combines the T and R images side by side and the combined image is projected through the emission filter and a second multi-band blocking filter onto a high performance CCD detector, where it is integrated to accumulate a signal for image processing. As Equation 2 highlights, we need to collect both transmitted and reflected light signals (images) to compute the confocal signal. Further, we can easily compute both the wide field (conventional epi-fluorescence) signal and the confocal without further exposure of the specimen. Note also that the calculation of the confocal image, C actively rejects the background (out of focus light) by subtraction, while the confocal signal is enhanced by a factor of ≈ 2. Hence we refer to SD-SIM as an active imaging technique. Poher et al 3 have recently shown that the axial response of a similar active background rejection system shows a faster roll-off than a point scanning laser confocal and greatly exceeds that of a slit scanner. 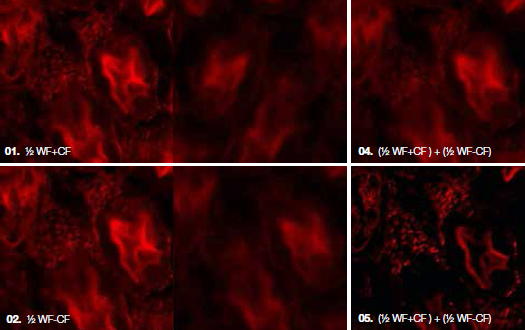 Figure 3. shows the basic principle of how the raw images are processed in order to achieve the final confocal image. It is worth noting that the Revolution DSD algorithms involve more than just the simple equations previously, but also include essential image registration to avoid mis-alignment artefacts, and the ability to adjust the confocal black level through changing the weighting of the subtraction. All of this can be performed in real-time with a live image, with no post capture processing required. The simple forms of Equations 1 and 2 hide one complexity in the principle of the system: i.e. the T and R images must be very well-registered for the calculations to provide high-quality confocal images. Any misalignment between the two will result in "registration noise". So an essential feature of image processing for the Revolution DSD is a high-performance, real-time image registration algorithm. The flow of the image processing algorithm used is shown in Figure 2. Figure 3: Rats Liver - Illustrates the image processing algorithm used to create T and R images as defined in Equations 1 and 2. Starting with the raw image collected by the camera the annotated tasks are executed by iQ in real time. Since addition and subtraction are very fast, compared to the registration step, both C and WF images can be obtained simultaneously. Note that the Confocal Black Level is adjusted by changing the weighting of the subtraction step to reject more or less of the WF signal. 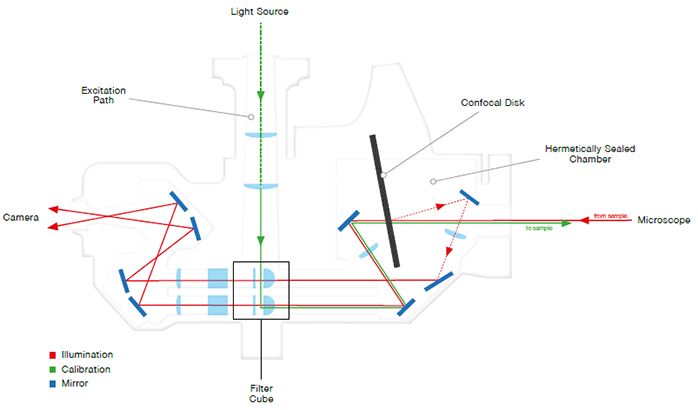 The use of a disk with 50% transmission for excitation and which uses both reflected and transmitted light images allows the DSD to achieve high throughput, solving one of the key problems associated with single disk confocal scanners. At the same time active imaging produces low background and retains sectioning across a wide range of magnifications, solving a second problem of single disk scanners. The use of incoherent broadband light sources delivers a costeffective, low maintenance instrument, with flexibility to operate with a wide range of fluorophores used in fixed and live specimens. A variety of sources including metal halide, xenon and emerging solid state technologies can be used. Revolution DSD allows users to work easily within the constraints of the SD-SIM architecture. Firstly the DSD’s confocality is strong enough at low magnifications to allow compensation for the reduced field-of-view resulting from dual image detection (T, R). Secondly Revolution DSD’s high performance image processing and precision mechanical design together ensure maximal pixel availability and long term system stability.